On cold gray mornings in January, it’s difficult to channel the joy of sunny summer days. The oppressive monotony of fog and rain can be a downer, making me long for heirloom tomatoes and fresh melons. Thankfully, the ground outside isn’t the only thing frozen around here. In addition to the stacks and stacks of jars holding summer’s bounty, our freezer was packed full last summer with berries, vegetables and herbs which I have to admit I had nearly forgotten about until this week. I was throwing together a quick lunch and while reaching for a package of spaghetti I suddenly remembered the cubes of pesto I had stashed in the freezer back in September when I couldn’t resist the last of the basil available at the farmers market. 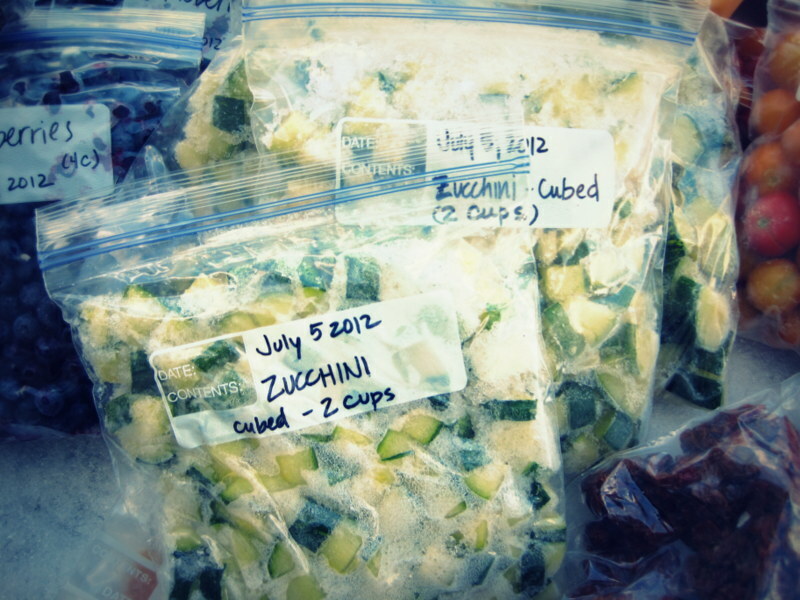 When I opened the freezer to pull out the pesto I uncovered bags of blueberries, plums, tomatoes, oven-dried tomatoes, zucchini, green beans and more. Oh happy day! 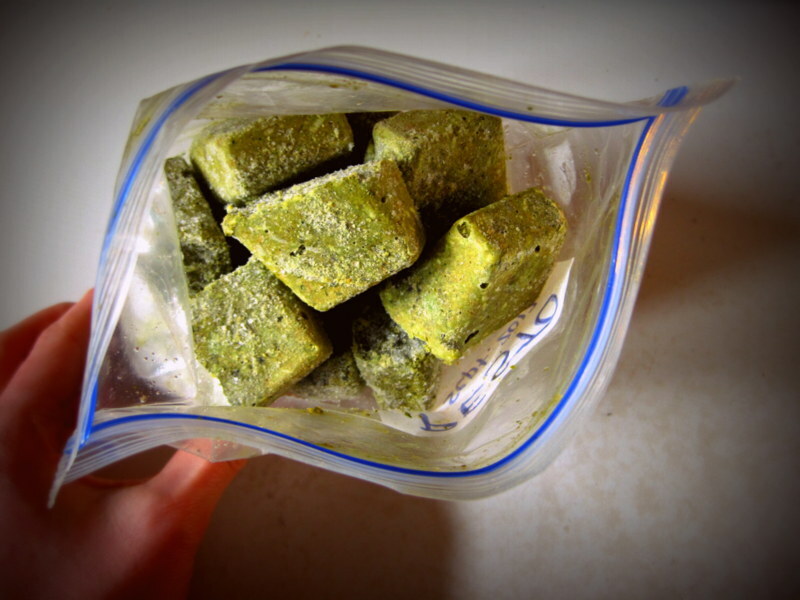 In my time, I’ve tasted some not-so-good frozen foods (frozen broccoli, anyone? ), but then again canned zucchini doesn’t sound all that appetizing either. I read up on the matter, and did my darndest to follow the ideal blanching times for each vegetable then froze them on a flat cookie sheet before popping them into a bag and sucking out the air. Frozen berries have always been great to make into smoothies or wintertime pies, and frozen green beans can cook up to keep a nice chewy texture (at least in soup or green bean casserole). Perhaps more importantly, however, is the safety of freezing vs. canning certain foods. Without a pressure canner (which we don’t have), you cannot safely can low-pH foods unless you add lots of acid (ie, pickling). So the freezer is the only option for us to save oven-dried tomatoes, pureed squash, green beans, etc. I resolved that this week I’d aim to use some more of those frozen gems rather than heading back to the grocery store. 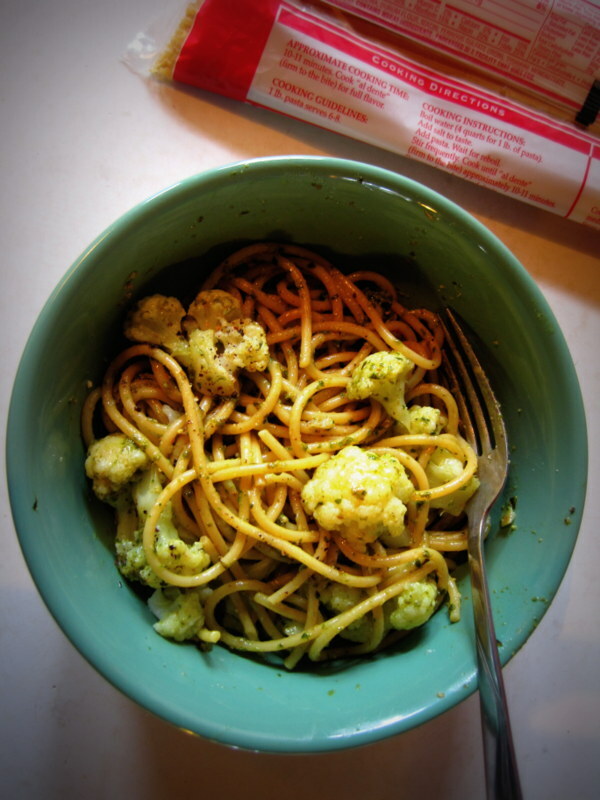 First up was pesto pasta with cauliflower. I was in a hurry, so about halfway through the cooking time for my spaghetti I tossed in a cupful of cauliflower florets, and they finished cooking just about the same time. In the microwave I melted a third of a cup or so of frozen pesto cubes, tossed it with the pasta and cauliflower, and lunch was on the table. The next evening I cooked up a pot of chickpeas with caramelized onions, tomatoes and herbs. I started out by simmering a pot of beans with garlic, onion and bay leaves. This is my standard combo to add to a pound of dried beans, which I tend to cook up once a week or so. One pound of beans is 89¢ – $1.50, and once cooked equals three cans worth. It’s enough to make two or three separate meals (or a few batches of hummus). If a can of beans is only $1, you’re not saving all that much by cooking them from scratch, but the texture is much better and you can flavor them however you like. In a separate pot, I caramelized a chopped onion slowly so it was a dark golden color and really sweet. I threw in half of the cooked beans (about 3 or 4 cups) and handful of oven-dried cherry tomatoes (from the freezer), along with about 3/4 cups of vegetable stock and some salt and pepper. After letting these flavors simmer for a bit, I decided to add some chopped rosemary and a tablespoon or so of pesto (also from the freezer). I also baked up some fresh pita bread (I highly encourage trying homemade pita, it’s so easy and delicious) and served the chickpeas along with steamed rice and a dollop of sour cream. This dinner turned out to be very tasty, and I’ll be making it again. Sunday afternoon we worked outside in the garden and though it was a fair day, soup really sounded like the perfect thing for supper. So I improvised on a favorite recipe a friend introduced us to a number of years ago: African quinoa and peanut butter soup with zucchini and sweet potatoes. As I started chopping veggies, I realized that I didn’t have on hand a few of the ingredients in the typical recipe (red bell peppers, sweet potato, fresh jalapeno) … so I improvised. Parsnips have a sweet flavor and firm texture, so those went in place of the sweet potatoes, with a few chopped carrots for orange color. Green pepper had to sub in for the red. I popped open a jar of the pickled jalapenos from this summer (whooooweeee they’re spicy and delicious!) and added a few slices of those into the pot. In a large soup pot, add the olive oil and saute the chopped onion along with the garlic and root vegetables (sweet potato, carrot, parsnip…). After they begin to soften (for me this was 5 minutes), add the diced bell pepper, celery, zucchini, and spices. * Saute for 5 minutes more. Add the stock and bring to a boil, then stir in quinoa and peanut butter. 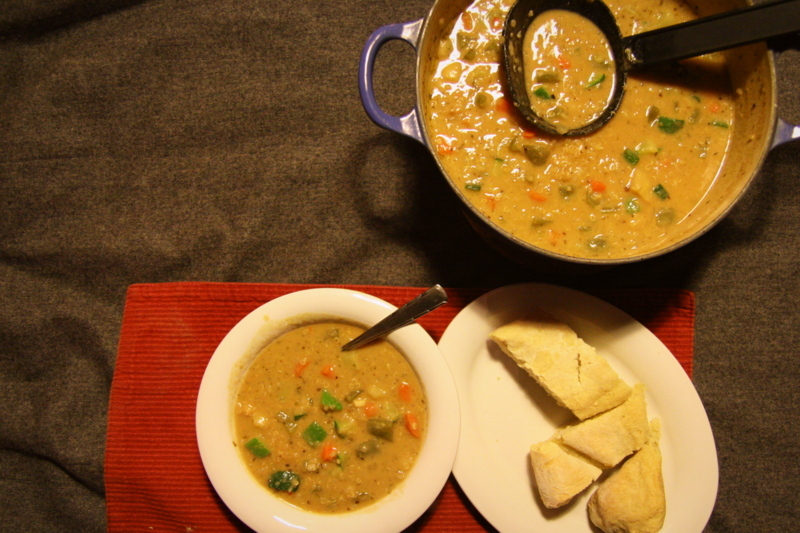 Cover and simmer for 20 minutes, or until quinoa is cooked and vegetables are tender. Taste & adjust seasonings if necessary. (This is where you add any frozen vegetables) Let the pot sit , covered, off the heat for 5-10 mins to cool. *If any vegetables are pre-blanched and frozen, don’t add them until the end of the simmering, then stir into the hot pot and allow to come to temperature. Never seen a recipe for soup employing peanut butter before! 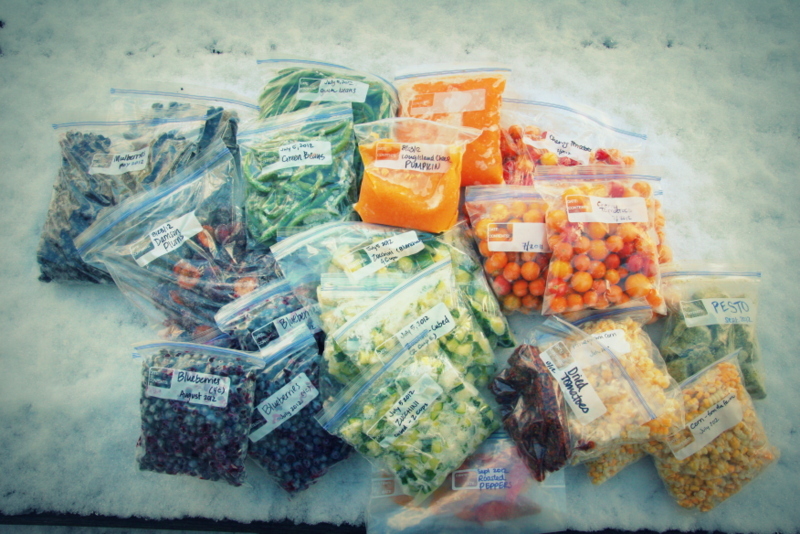 And I’ve never seen a photo of freezer foods that looks so good. in fact mouth-watering. The orange bacg could be one of mine, don’cha just love that color? I mean, when there has to be freezer food, it’s nice when something’s a cheery bright orange. How’s biz? Whatcha up to?